You do not need to do anything special to call an R package. Provided that an R package is installed, you can call library(package) from inside a SUBMIT block to load the package. You can then call the functions in the package. Similarly, you do not need to do anything special to call R graphics. The graph appears in the standard R graphics window. The example in this section calls an R package and creates a graph in R.
The program creates an R matrix Pressure from the data in the min_pressure variable. Because the functions in the KernSmooth package do not handle missing values, the nonmissing values in Pressure must be copied to a matrix p. The Sheather-Jones plug-in bandwidth is computed by calling the dpik function in the KernSmooth package. This bandwidth is used in the bkde function (in the same package) to compute a kernel density estimate. The hist function creates a histogram of the data in the p matrix, and the lines function adds the kernel density estimate contained in the est matrix. The R graphics window contains the histogram, which is shown in Figure 11.5. 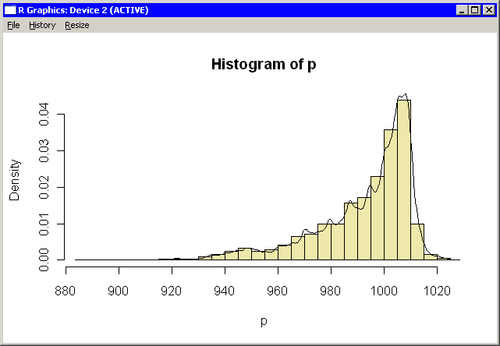 You can compare the histogram and density estimate created by R with the IMLPlus graph shown in Figure 6.4.